This Gothic Revival church was designed by Pittsburgh architect William P. Hutchins in 1936 to accommodate the growing needs of the parish. This is the third church built on the site, and the second that is St. Mary’s. A priest and other members of the parish will be on site to show you around and answer any questions. 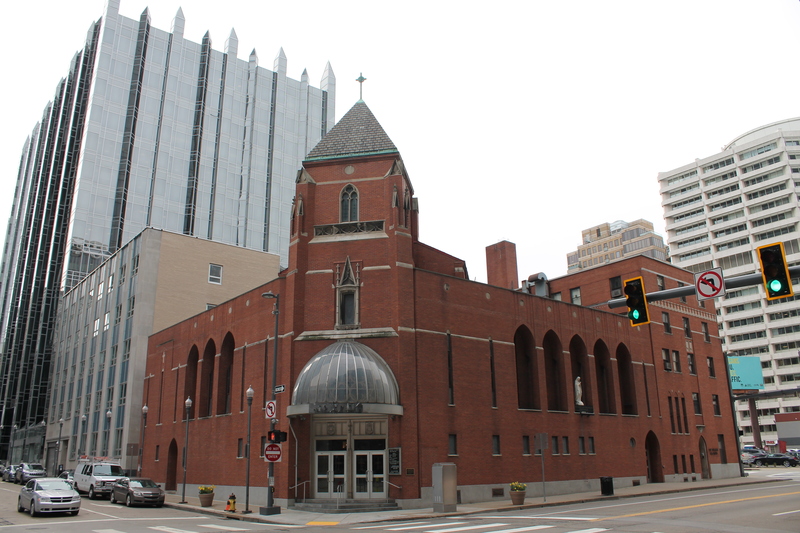 Saint Mary of Mercy Church is the Roman Catholic church in Downtown Pittsburgh. The church building was completed in the Fall of 1936. In fact, the building was under construction during the great Saint Patrick’s Day flood of 1936 and there is a marker near the entrance of the church indicating the water level at that time. Saint Mary’s is also home to the Red Door program which has been serving lunch to the needy six days a week since the Great Depression. Saint Mary of Mercy continues to serve those living, working, and visiting Downtown by providing a quiet place of refuge amidst the busyness of the city. We hope that you enjoy your visit with us and please know that you are welcome any time!